I love Stuart. I can't believe that Sara Pennypacker's cape-creating, glasses-wearing, cutest ever worry-wart of a kid got nixed after only two books. Stuart, who began his short life is Stuart's Cape, was partly base on one of Pennypacker's nephews. Pennypacker's imagination filled in the blanks and what wonderful and wacky adventures she created. Stuart is as insecure as any kid who has just moved and whose best stuff got accidentally mistaken for a box of garbage. No wonder Stuart is a worrier. School is still weeks away, he has no friends, and he is bored. A superhero cape, he decides, is just the thing. He staples together his father's tossed off ties and adds a secret pocket made out of sock and and he has it, the perfect cape. How could it not be magical! Dinosaurs jumping on his bed, eating lighter than air sponge cake that floats him up up up, and growing giant toast are a few of the weird and wonderful adventures Stuart has when he's wearing his cape. Of course, magical capes can get you into trouble if you're the least bit careless. But I don't want to give it all away. 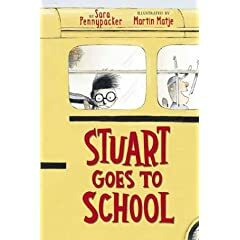 Pick up a either Stuart's Cape or Stuart Goes to School, and I'll bet you'll be writing to publishers writing demanding more of Stuart's adventures.